Ten Days in October 2015 » Were you there? Ipswhich one? You tell me. 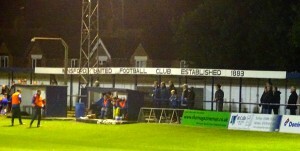 I got to The Barton Stadium, quaint home of Winsford United very early on Monday evening. Eo-n were the sponsors and were proud of their achievements in upgrading the floodlights and painting nearly every building in the clubs colours! As I was wandering round the ground taking the odd picture, I didn’t notice, lurking in the long grass, Chris, Jack and Graeme, who leapt out at me, gave me the fright of my life and started singing:- “Happy Birthday to You!”. Two more and I’ll be a septuagenarian, I thought, and I’m being treated like a two year old! 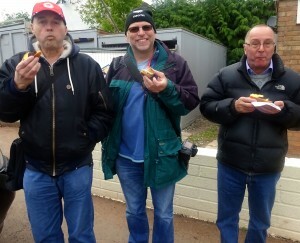 Still, it was good to see them and we enjoyed the match together. Not that the match was that good! Two goals in the second half gave the home side the victory, but did little to relieve the ennui. Barton Park is quite an old fashioned ground and at one time it also hosted greyhound racing and the remains of the greyhound track are what give the pitch its oval looking shape. 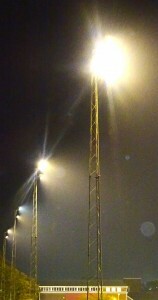 It also gives it that odd, eerie, lonely feeling, even when a game is in progress and, especially, at night! It is eight years since my last (and only) visit to Wodson Park and I didn’t recognise it! 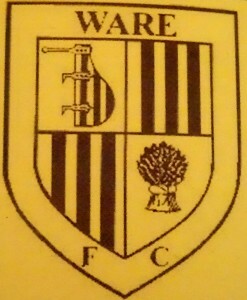 Ware have a neat ground with a 200 or so seater stand on one side and covered terracing opposite. 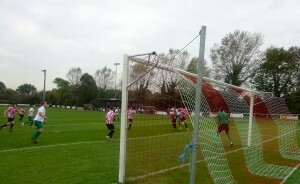 Ten days ago, they had taken all three points in a league fixture at home to Northwood with a 2-0 scoreline. This evening, it all went wrong after half-time. 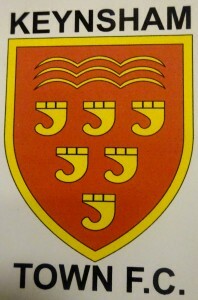 Until then, they held a 1-0 lead, but a considerably more determined Northwood entered the ‘fray for the second session. They equalised twice – the second time in the final minute – and, there being no extra time, they went on to win the penalty shoot out, thanks in no small measure to the excellence of their goalkeeper. It was a good match! It was a pretty filthy night at Dickens Road for my first visit in over ten years. 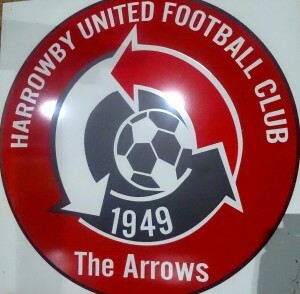 During that time, Harrowby had sunk to the bottom of The Lincolnshire League and then become defunct. 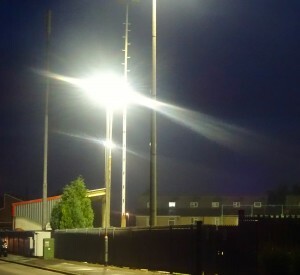 They returned as Grantham Rangers to play at Grantham’s South Kesteven Sports Centre, but it wasn’t until 2012/13 that they returned to their own stadium under their own name in The UCL. 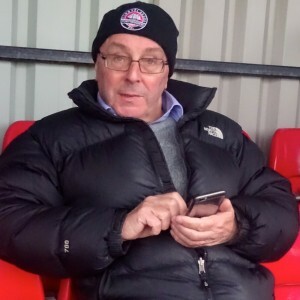 This season, they are languishing just a point above the relegation positions, some twelve points and twelve places below their visitors, the perennially achieving Holbeach United. The first half was as dire as the red and black painted panels behind each goal – corrugated metal at one end and wood at the other – but the visitors perked up in the second half and took command with three goals in the final half-hour. There was an excellent programme – a statto’s paradise – but no-one could tell me the attendance! Admission:- £2 Programme:- None I came to Hayden Road this evening for a Northants Senior Youth League match against Desborough Town, so it was something of a surprise to find when I got there that it was a cup match against Northern Star! There was a large gathering of older students from the Ferrers School to cheer on their mates, but, apart from the goalkeeper, who had a superb performance, the team were comprehensively outclassed by their big city neighbours. 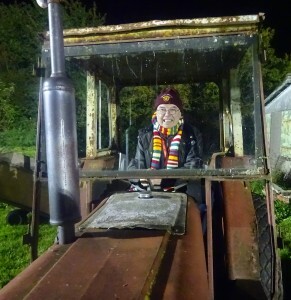 Corsham Town was a re-visit, but on a cool, sharp evening, the home side, riding reasonably high in the division, were shocked by lowly Calne Town who deservedly took the victory and the points! This rusty old relic decorated the nether regions of the stadium and, having perhaps unwisely, been persuaded to pose in situ, I found the photo plastered all over Facebook even before half-time! Corsham Town’s Lacock Road ground is much as I remembered it when I visited in November 2002 although the welcome was more effulsive on this evening and the refreshments certainly more appetising! Equally, the attendance was just about three times as many on that gloomy November afternoon! Jack and Chris and I had enjoyed the journey down from Blaby in Leicestershire, with John at the wheel and at Bristol Parkway Railway Station, having parked the car, we joined the throng of like minded hoppers to await the coach to Corsham! After the match, it was a long journey to Weston-super-Mare – made even longer by the detour back to Bristol Parkway Station – and it was past 11.00pm when we arrived at The Royal Grosvenor, the sea front hotel booked for our stay! Simon from Cheltenham (an avid Hereford United follower) and Dave from Reading and a Reading FC season ticket holder, enjoy the match from the tiny seated stand! 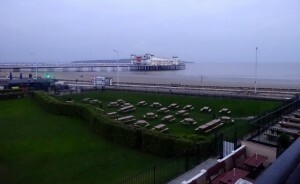 Referee:- Simon Shaw Attendance:- 217 The view from my hotel window at The Royal Grosvenor Hotel on the sea front at Weston-super-Mare. It took me back to a long ago, almost forgotten, ‘hop’ when we stayed in an hotel on the sea front at Aberystwyth! 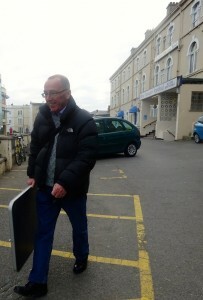 John carries the fold up table out to the coach as the first full day gets under way! 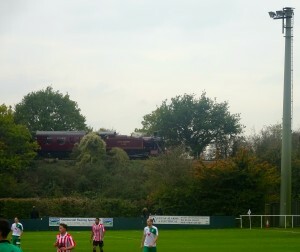 Football and Steam Railways …… Two bites at the cherry! 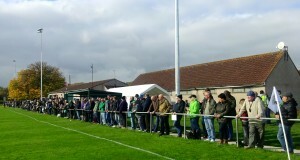 We were made to feel very welcome at Bitton, and, despite it being the first match after the hotel breakfast, the tea ladies were kept pretty busy throughout the match! This is a strange one! Tantalisingly, I can’t see the front of the engine in this photograph, but it looks remarkably like a Metropolitan Railways 0-6-4T and if it really is, then it will be around about 100 years old! 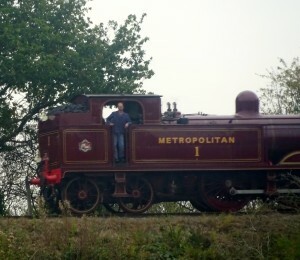 The Metropolitan Railway picked up a couple from an engineering works in Yorkshire around 1915/16 in the middle of The Great War, but they were never popular and none further were ordered. Referee:- John Ignat Attendance:- 201 This was a strange ground. The football pitch was at one side of a huge field, the vast majority of which seemed to be used for parking cars before the match! 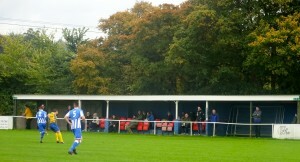 Down one side of the ground was a covered area and behind the near goal was the club house and changing rooms. 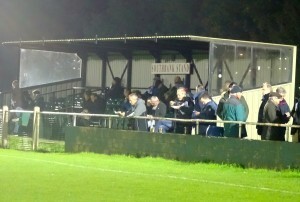 The covered area on the far touchline. This was a fine game. Both of these teams were in Division ! 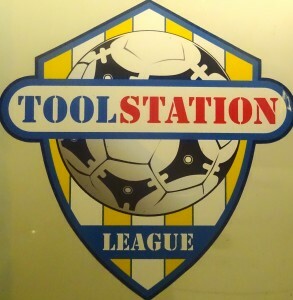 of The Toolstation Western League, but they were effectively at opposite ends of the table. 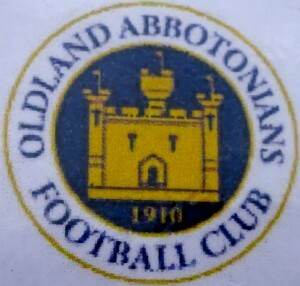 If Oldland Abbotonians won their five games in hand over leaders Corsham, they would have a comfortable lead at the top of the table, whilst Ashton & Backwell United were languishing in 17th place with only four teams below them. Today’s attendance of 201 must have been a real godsend for the hosts, who had averaged just 34 spectators per match in their seven previous home games! A special effort had been made with the refreshments and I particularly enjoyed the vegetable and rice dish. It was something of a surprise when the visitors, without too much difficulty, ended the first half with a three goal advantage, Conor Biggins scoring all three including one from the penalty spot! Ashton & Backwell were good value for their lead. They had played the more adventurous football and taken their chances well, but they must have known that the hosts would dig deep and attempt to repair the damage! 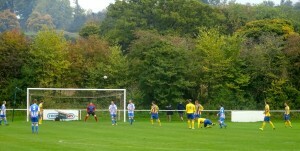 Abbotonians scored on 50 minutes and kept up the pressure. The visitors snatched a fourth goal with a breakaway and it looked to be all over. However, back came Abbotonians and two goals in the last couple of minutes saw them fall tantalisingly short of snatching an unlikely point from the contest. Ashton & Backwell deserved their victory! 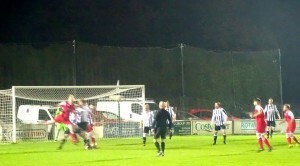 Almost the last kick of the match was the penalty scored by home number 9 Dave Stone. Who’s been into the boardroom to pinch all the cake!!!! The weather began to get a little cooler as the day wore on. 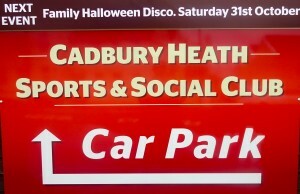 Springfield, the home of Cadbury Heath, could hardly be called an enclosed ground. It was a field with a railing around it and a covered area down the near side. The club house was outside the railed field and I wondered how they had managed to retain step five status while the likes of Bourne, of The United Counties League, and their nearly totally enclosed ground had been demoted to step six because ‘nearly’ was not good enough! 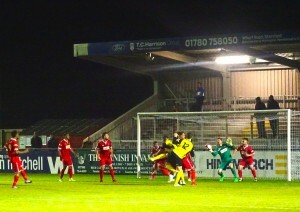 After the previous match, we probably expected much more from a Premier Division clash than we were ever likely to get! 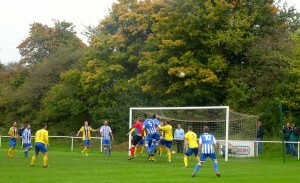 However, both of these clubs were wallowing just above the drop zone and a thriller was never likely! It was an awful game. Dour and desperate as both teams fought to avoid defeat, the hosts carried the greater threat, but Cribbs allowed them little time or space and the match meandered into obscurity, a blip on the kaleidoscope of matches over the weekend and the season! Margaret had made the quote of the weekend at the previous match at Oldland when she ran out from the boardroom with a slice of cake and announced to all and sundry that West Ham were beating Crystal Palace 1-1! Burnley was happy! They’d taken three points off Bolton Wanderers! 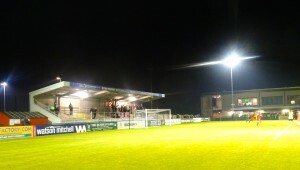 The last match of the day was at Keynsham Town’s AJN Stadium, a ground I had visited only once before in February 2004. This was a new and much improved arena with a high quality plastic pitch and a renovated stand … and yet, for all that, it had a strangely cold feel to it and seemed to lack atmosphere. The game more than made up for that, however, with little fancied Westbury taking an early lead with a speculative and slightly fortuitous header which deceived the goalkeeper. 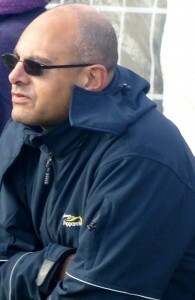 It was a lead that they were to hold for over an hour, but the introduction of Bertrand Abang by the home team at half time gave them increasing sway and it was he who equalised on 74 minutes and less than ten minutes later, Keynsham took the lead and the result seemed a foregone conclusion. 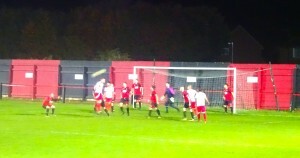 Right at the death, in the second minute of injury time, a Westbury forward chasing a lost cause crossed the ball into the six yard box – no danger, not a visiting player in sight – but it was inexplicably lashed into his own net by the home number 4, Jason Adams. 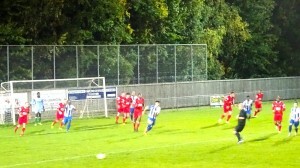 Westbury had rescued a deserved point. Yet another trip to Bristol Parkway Railway Station this morning before journeying out into the vast expanse of the Gloucestershire countryside! John, Jack, Chris and I opted for the car from Bristol Parkway so that we could go straight home after the last match and not have to face yet another visit to Bristol Parkway Station! 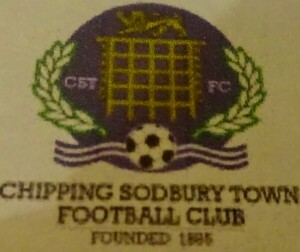 Chipping Sodbury Town are new to The Toolstation Western League, having been promoted at the end of last season from The Gloucestershire County League. They have had to do a substantial amount of improvements in a very short space of time at a site where they share the space with other football teams and the Rugby Union club. They have fenced off their own pitch and added floodlights and for today’s match there was a small marquee where hot drinks and refreshments were available. 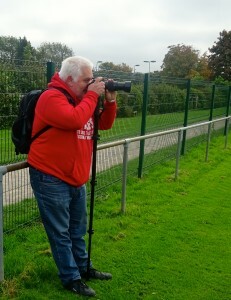 Martin with his ever ready camera at Chipping Sodbury! 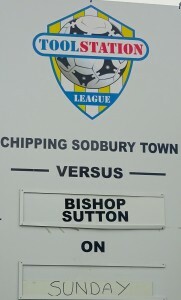 Today’s opponents, Bishop Sutton were champions of The Western League some three years ago, but in that short space of time, they have been relegated and fallen to the very bottom of the league with only one draw to show from twelve league games this season! How the mighty are fallen! The hosts were one up inside two minutes and four more followed in the first half with hoppers eagerly anticipating the breaking of goalscoring records! It was not to be. Although the home side added a further three goals in the first fifteen minutes of the second half, that was the end of their goal blitz and a Sam Keat own goal gave the visitors a consolation! Melksham is probably my favourite Western League ground, certainly it is the best equipped of all the grounds we have seen this weekend. I had made two previous visits, but had, in fact, only seen one match. The first time I came, I arrived barely twenty minutes before kick-off after an horrendous journey only to hear that the match had been called off five minutes earlier by the referee! 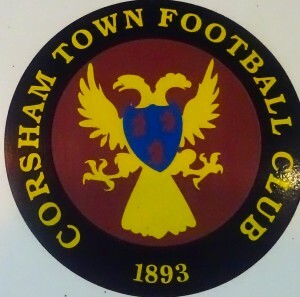 The Conigre, home of Melksham Town, at least for the time being, takes its name from a wildlife sanctuary – a hive for rabbits? 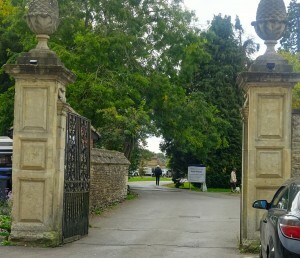 There were supposed to have moved to a new home on the outskirts of Melksham in the grounds of an educational establishment, but, so the story goes, wildlife in the form of newts were discovered and much of the work has been put on hold until a way can be found to preserve the newt’s habitat. It is possible that they could move to their new home from the beginning of next season. 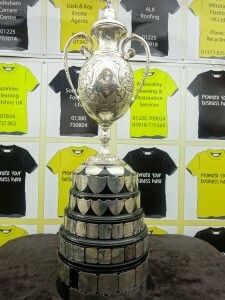 Melksham Town are the current champions of The Toolstation Western League and the championship trophy was on display at the ground. They are in good company. I was told that clubs like Tottenham Hotspur and Millwall had both had teams at one time that had won Western League championships! Artists and architectural impressions of the new stadium. 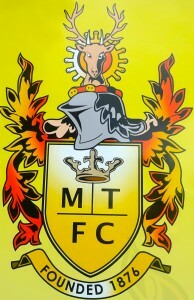 Melksham Town’s defence of the championship has been less than robust, although it is early days in the season, yet, and they are in touch with the leading group in the division. The Conigre is a lovely old quirky ground and just outside these gates used to be Frog Lane – it no longer exists, I believe, but is a testament to The Conigre’s wildlife connections! The players get tap water to drink during the game and here is the proof as the trainer can actually be seen filling the water bottles! Is there something in the local water that breeds champions? The game was over in a blur of activity. Gillingham Town were no mean opponents and in the second half they really chased the equaliser only to concede a second to the hosts prolific goalscorer, Gary Higdon. 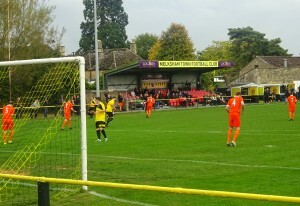 Two minutes from time, they managed a consolation, but it was Melksham who took the spoils. 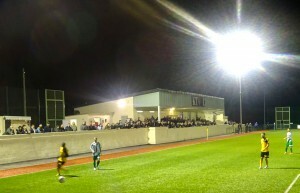 Despite their lovely, quirky ground, Melksham seriously need to move to a new stadium as the present home would not support football at a higher level. 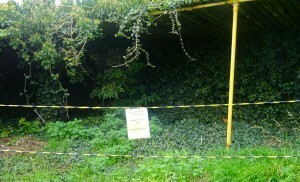 Parts of the ground are sealed off and there is only one entrance and no turnstiles. I will have a great many regrets when they do eventually move, but I respect the reasons for the club taking that decision! 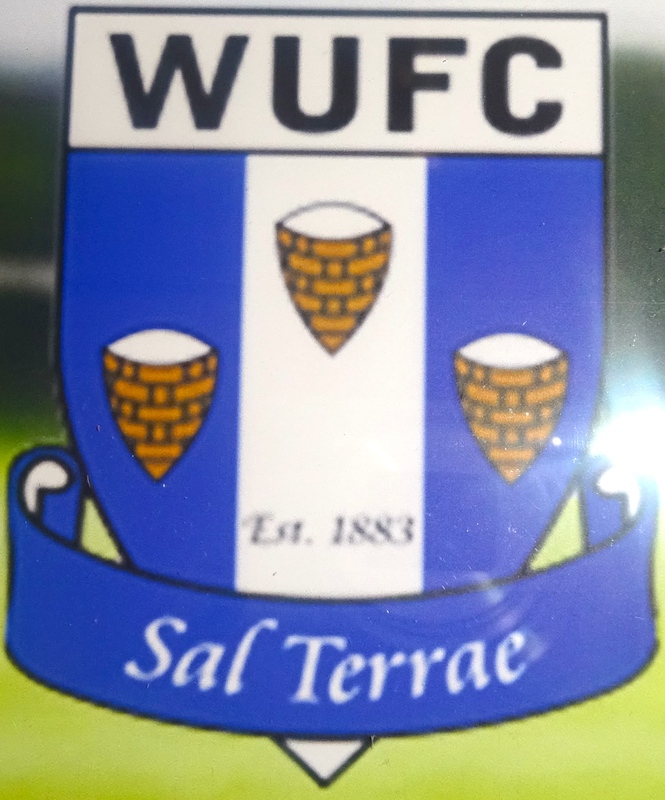 We headed back straight away after the game and, three and a half hours later I had reached my own home after an exhilarating weekend of Western League football. Late night returns to the hotel and early morning starts meant that every day was a long one, but each was scintillatingly worthwhile. All the clubs involved had gone to enormous efforts to make a success of the venture. We were welcomed and refreshed and cosseted at every venue. As usual the anticipation of the hop was excruciating but the event itself flew past in a whirl of matches that all seemed to meld together. Many thanks to Chris and Laurence, who had, as usual, provided a well choreographed event and had done their best to fit in with individual requirements! The next ‘hop’ (The Lowland ‘hop’ in March) seems such a long way off but it will be upon us before we can blink and, in the meantime, I am trying to achieve more than 120 matches by Christmas ……. weather allowing ..!!! You might expect that living only ten miles away, I might have already been to The Zeeco Stadium. Well, I have, on TWO occasions and each time the match was called off – the second time because the opposition failed to turn up! I was impressed with the new build. It has a real ‘football ground’ feel to it, not like some of these tin can monstrosities (like Wisbech Town, for instance) which some clubs have built. 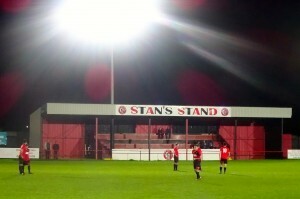 Sadly, Stamford AFC are in trouble at the foot of The Evo-Stik Northern Premier League Premier Division table, which is a pity, because they are a friendly club and always helpful with information such as handing out free team sheets and finding out the attendance. 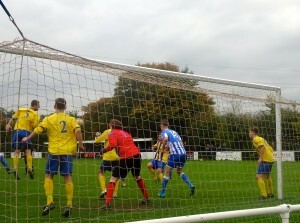 Halesowen Town are no more than a mid-table side and yet they always seemed the team more likely. 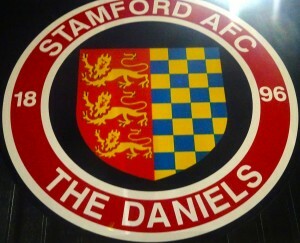 Stamford lack an out and out striker, they rely heavily on a defence that is rarely watertight and after pulling themselves level, late in the game, they let it slip away with a second Yeltz goal with fifteen minutes to go. This was an impressive, but eccentric stadium. I had come down by train because Lewes is on a direct line from Bedford, but there are some twenty stations to negotiate and the journey took me over two and a half hours! 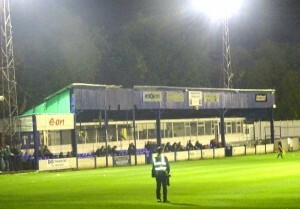 The entrance is the impressive bit, the modern arched roof over the stand and the substantial concrete terracing behind the near goal. 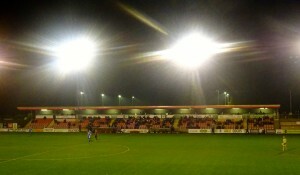 There is a large stand to the right seating maybe up to a thousand spectators. 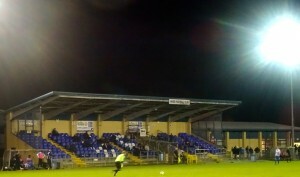 The eccentric area is to the left of the terracing behind the goal where a selection of beach huts have been erected to act, I can only presume, as hospitality suites! 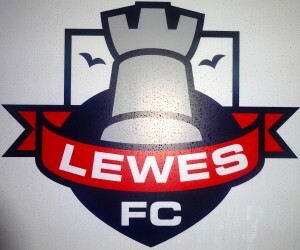 The stadium is a natural bowl, some say it was the excavation of the monks of Lewes Prior when they were mining for salt. 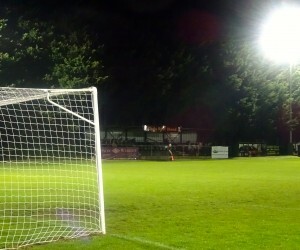 Opposite the main stand is a vast grassy embankment which is unused and sealed off, but at the top, and with a splendid view from behind the floodlights, is a narrow walkway which can accommodate spectators. 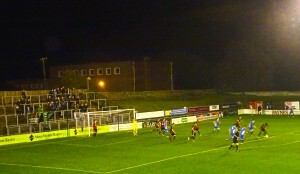 Behind the far goal is a section of terracing with barriers, but it is not accessible from the high back opposite the main stand. 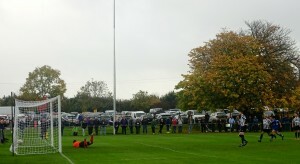 Once you get to the bottom of the substantial terracing behind the goal, space is cramped, because the clubhouse takes up much of the space to the right of the goal. The stewards were very helpful, team sheets were handed out in the club house and at the end of the match, two stewards got on their walkie-talkies to find me the attendance and the made sure that it was broadcast over the tannoy. 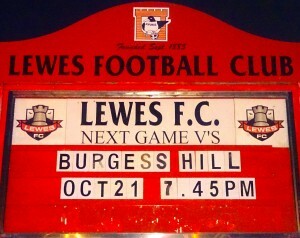 Sadly, on the field, Lewes are in disarray. They lie in the bottom three but are some five or six points adrift even at this early stage of the season. 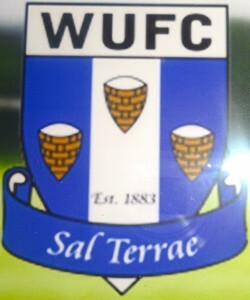 fifteen years ago, they were starting their journey to the highest echelons of non-league football. Now it seems that they are sliding in the opposite direction. 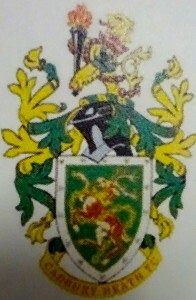 Burgess Hill Town are near neighbours (also on the railway line from Bedford to Brighton) and they had little trouble in disposing of a dispirited home side who did show some determination in producing an equaliser just on half-time. That was just to prolong the inevitable as the visitors regained the lead with fifteen minutes remaining and deservedly took the match and the points. The long trip back to Bedford began conveniently with the 21.50 from Lewes Station and ended at 00.38 at Bedford Station. Then I had an hours journey by car back to Gretton! 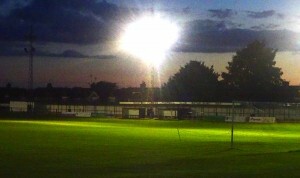 Fabulous view from behind the floodlights on the embankment! 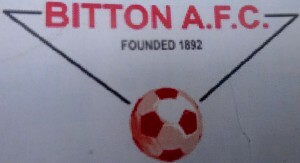 Northwich Victoria are playing for the time being at the home of their greatest (and most deadly) rivals, Witton Albion. There is no love lost between the sides, but even so, when I arrived, the only stewards I could find on duty were from Witton Albion or from Chorley! 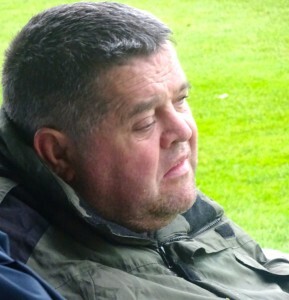 There were no badges available, but the refreshment hut away in the far corner of the ground was doing a roaring trade and sold out of pies ….. so I enjoyed a pastie, instead. 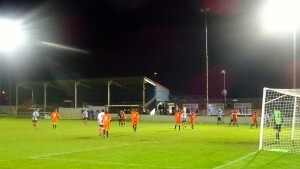 Considering that the visitors were two divisions higher than their opponents, it was the hosts who imposed the early pressure and Chorley’s defence had to withstand prolonged attack. Darren Stephenson of Chorley, sporting what I thought was a somewhat bizarre away kit until Tony Morehead suggested that it might have been chosen because today is Breast Cancer Awareness Day! On a cold, grey afternoon with rain in the offing, Weldon United, presently unbeaten this season and leading the premier division of The Northants Combination, came to The Grange for a second meeting in as many weeks at Earls Barton, after winning the league encounter by 3-1 in their previous visit. There was a fairly impressive trompe d’oeuil surrounding the clock in the club house (well, at least, it had me fooled), but Weldon, who started slowly, had built an unassailable 3-0 lead by the interval. Poor old Earls Barton, had recently lost their manager, and, with him, a choice selection of players.In the second half, they managed to score, but it was a consolation only, as unbeaten Weldon wrapped up a comfortable victory!